Iffley Road track, Oxford, England. Here's a fun and quirky update for the 100,000 mile website. 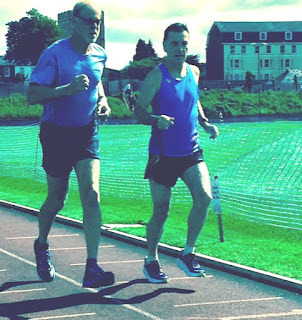 Mike Fanelli and I ran a ceremonial mile today on hallowed ground - the Iffley Road track in Oxford where Roger Bannister ran the first 4-minute mile. (We are in London for the World Championships). At this writing we are both at 107,703 miles. I finally caught up! I have been chasing Mike since I started running 42 years ago; he was my coach in the '80s. We live about 10 miles from each other in Sonoma County. I'm running about 5–10 miles more per week at the moment, so will now be ahead for a while. But he's 5 years younger than me so unsure how long that might last.